One major cause of slow-but-sure weight gain is bad snacking habits. Just one unwise snack a day could put over a half a pound on your waistline every week. However, mid-morning and mid-afternoon snacks are very important in order to stabilize your blood sugar. In order to do this, you need to eat every 2,5-3 hours. 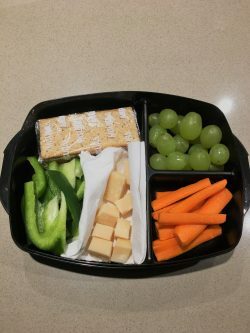 Healthy and well-balanced snacks between meals prevent overeating at actual meals. Think of snacks as mini-meals that contribute nutrient-rich foods. You can fit snack calories into your personal healthy eating plan without over-spending your day’s calorie budget. Snack only when you’re hungry. Skip the urge to nibble when you’re bored, frustrated or stressed. Feed the urge to do something by go for a brisk walk, give a call to your friend or do anything, which is suitable for you. Keep portion control in mind. Have a single-serve container of fruits and vegetables or put a small serving of nuts in a bowl. Eating directly from a multiple-serving package can lead to overeating. Plan snacks ahead of time. Keep a variety of nutritious ready-to-eat supplies on hand, such as whole-grain crackers, oat cakes or wholegrain rice cakes.